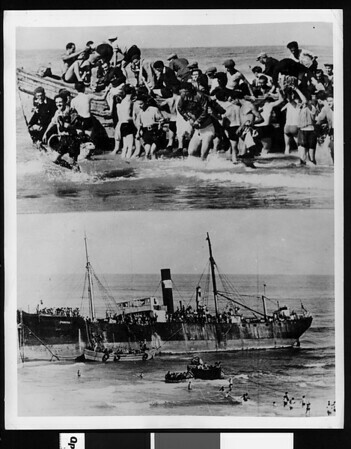 An image combined of two photographs showing Jewish refugees who "crashed" Palestine from a beached ship. "KY886729 | Watch your credit | International News P[oto] | Slug (Jewish refugees-2 combo) | As refugees "crashed" Palestine from beached ship| Tel Aviv, Palestine... Here are two spectacular photos, showing the landing in the Holy Land of 700 Jewish refugees from the S.S. Parita, whose captain and crew had deserted the ship, leaving it in the hands of its passengers. In lower photo you see the beached Parita as the refugees lowered boats over the side. In upper photo one of the life-boats reaching the beach, where the refugees were enthusiastically greeted by citizens of Tel Aviv. W.9-1-39-10.00" -- typed note attached to verso. "Received. Examiner reference library. Sep 7, 1939" -- stamped on verso.